The challenge of teaching programming languages and paradigms is a very complex task that requires of adequate strategies and educational tools. This chapter presents a game-based educational tool, Trivioodle, developed and used to support the teaching and learning of programming languages and paradigms. Trivioodle is integrated into the learning management system Moodle that is used as educational eLearning platform by the University of Valladolid. The chapter describes the mechanics in playing Trivioodle. 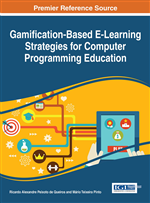 The chapter also describes the result of a qualitative analysis of its use in two engineering courses related to programming offered to students in two different study programs at the University of Valladolid. The use of games as learning tools is known as Game Based Learning (GBL) and has increased its importance during the last decades. Internet, the Web 2.0 or the social networks has contributed to this. Technology-based games are very popular for the younger generations, as for them technology has always existed and is integrated into their lives (Simões et al., 2013). The possibility to play online thanks to wireless and broadband networks promotes the use of games in mobile devices such as smartphones and tablets. Augmented Reality and Mixed Reality offer new possibilities in the development of games. All these improvements in technologies, as well as the continuous upgrades in the user interfaces, allow new ways for players to interact among themselves (Simões et al., 2013). Another fact is that games may allow the participation of numerous players and this is one of the reasons why GBL is becoming an innovative learning framework to develop abilities related to the Computational Thinking (CT) (Kazimoglu et al., 2012).